Many growing methods seem like common sense once you’re actually aware of them. For example, low stress training seems like an obvious thing to do once you understand that exposing more of the plant to light makes for more buds. This week, we’re revisiting a topic that many newer growers may be unaware of: The Perpetual Harvest. The idea of the Perpetual Harvest is very simple in nature, so it might not seem like much. But it’s one of the best methods of ensuring a steady supply of cannabis when you need it. 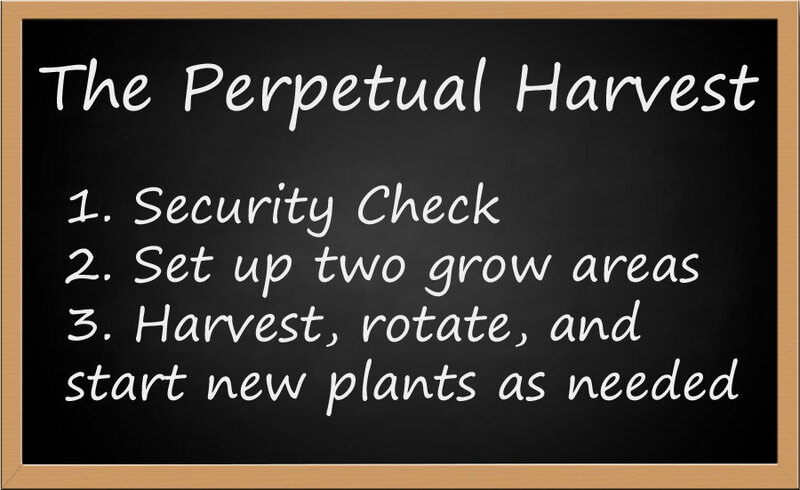 What is The Perpetual Harvest? The Perpetual Harvest is a technique in which growers utilize multiple grow tents/areas to ensure that there are always plants in both the flowering stage and in the vegetative stage. That sounds like a lot of work, why would anyone want to do this? If you lose your flowering or vegetating plants to some unforeseen cause, you still have another set of plants who are already mid-growth! 2.) Never Run Out of Cannabis! Maybe you grow your own marijuana, but you still end up running out of buds before harvest. You can cut down on your cannabis budget by growing a few plants here and there, but it’s even better when you eliminate it altogether! Plus, you’ll never know that your options to buy cannabis have disappeared until they already have! Is this going to take additional money/equipment/time? To keep two sets of plants growing in two different cycles, you will need to keep them in separate areas. 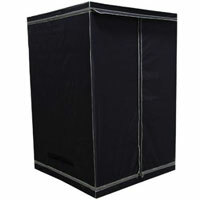 This requires an additional grow tent or area, whichever works for you. 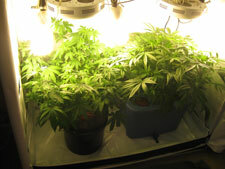 Some people split a single grow tent or cabinet into separate vegetating and flowering chambers. 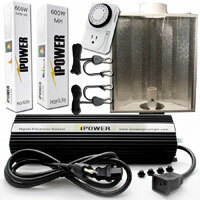 Both sets of plants will need their own grow lights, so you will need two sets of lights that don’t share bulbs. The vegetative light can be weaker than the flowering one, as young marijuana plants don’t need as much light. 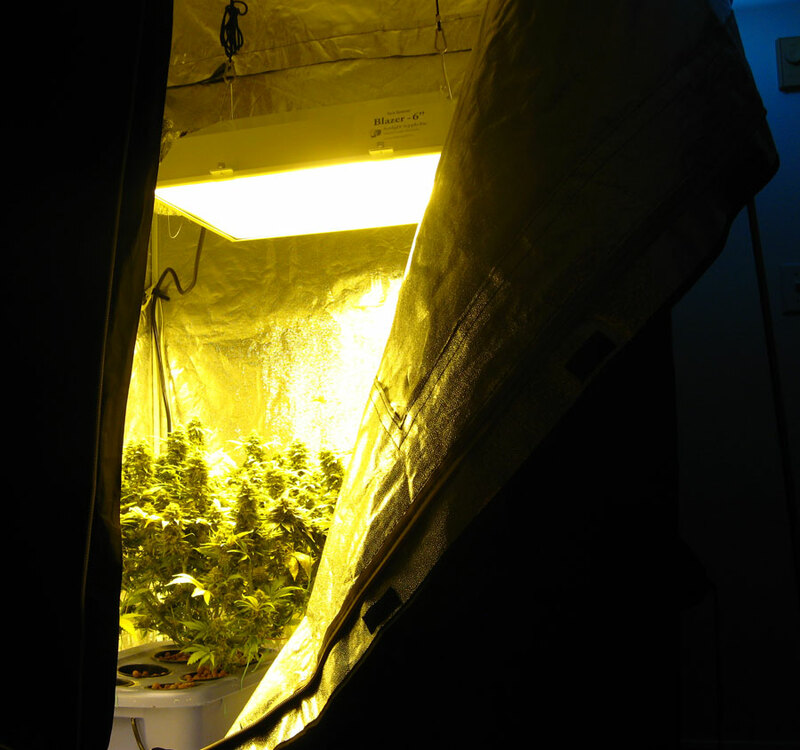 Example: a T5HO fluorescent light or 400W vegetative light in one tent, 600W flowering light in the other tent. You’re going to have roughly twice the amount of plants growing, which takes more space and will raise your electricity bill. Just keep in mind that you will also be harvesting bud twice as often, too! To be honest, this technique takes a bit more work than a standard grow every 3-5 months, so only use this technique if feel you’re up to spending more time with your plants! Alright, we’ve got the common questions out of the way and you know what benefits you’re getting…let’s get into it! Perpetual harvest means you ALWAYS have weed growing in your house, so your house is always a DANGER ZONE! You’re going to be using at least two grow areas/tents, so do a walk-around your house and make sure that light doesn’t pour out of the windows of the room(s) they’re in. Doubling the number of grow areas means you have more area to secure. Every grow area will be set up differently depending on the grower, growing space, and resources available. In short, your goal for setup is just to have two copies of your normal grow area, except that one is configured for vegetative growth and the other is configured for flowering growth. Perpetual harvest requires two grow areas that operate simultaneously, so it’s best to have them both set up and ready to use so plants can be switched between them without too much fuss. The vegetative area can have weaker lights than the flowering area, and watching for light leaks isn’t as important since a dark period isn’t required. Although vegetating plants don’t make too much of a smell (if any), it’s still a good idea to have the area at least lightly equipped to combat smell. A small container of Ona gelin your living space should take care of it if you notice a problem (just never let Ona gel near your plants in the flowering stage!). The flowering area MUST BE LIGHT PROOF. Light leaks can stress out your cannabis plant, prevent buds from forming, and can lead to hermaphrodites. You don’t want that! Controlling heat is also more important in the flowering stage to get the best growth while avoiding pests, mold and damage to the buds. Too hot or too cold temperatures can really hurt your yields in the flowering stage. 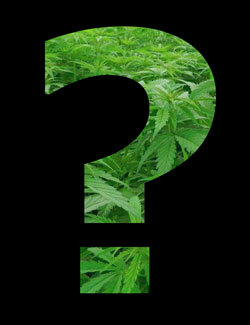 A big factor in timing the perpetual harvest correctly is knowing the growth patterns of the strain(s) you’re growing. There is large degree of variation between the flowering cycles of different marijuana strains, and knowing how long your plants need to flower is imperative! Ideally, you want a strain with a short flowering phase. 8 weeks is a good target since many great strains flower in that time, and 8 weeks is also a good amount of time for a plant to vegetate in a non-DWC/bubbleponics medium. Doing the perpetual harvest technique with a Haze strain is much more difficult due to their notoriously long flowering period. Do you have to vegetate for 8 weeks? No. Vegging for 8 weeks isn’t a requirement of the perpetual harvest, but that time period makes this technique much easier. The amount of time varies depending on what medium you use, how big you want your plants, and the strain being grown. However, for most cases, and to make it easier for the first few tries, you typically would want to get a strain that flowers in 8 weeks and keep your plants in vegetative for about 8 weeks. This causes a problem for DWC/Bubbleponics growers since their plants grow so fast and can get GIGANTIC in that time. 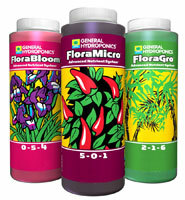 Growers who use one of these mediums can still employ the technique by staggering the grow so that the new plants start vegetating after the older set of plants have been flowering for about 4 weeks. 1.) Do a security check of your area…seriously! One flowering area with heavy odor control and NO LIGHT LEAKS. Get seeds or clones of a strain with an approximate 8 week flowering period. Plant/clone first plant and let it vegetate for a total of 8 weeks in the vegetative tent/area. At week 8, move plant(s) to flowering tent and start new seeds/clones on the same day. In about 8 weeks, flowering plants will be ready to harvest and veg plants will be ready to start flowering. Remember, the goal is for plants to spend 8 weeks in veg, 8 weeks in flower, then get replaced. Don’t worry if flowering goes a couple weeks longer than you anticipated. Cannabis plants can be kept in the vegetative stage as long as needed (except for auto-flowering strains), and with proper LST the extra growth won’t be a problem. That’s it! Are you ready to start harvesting buds every 8 weeks? 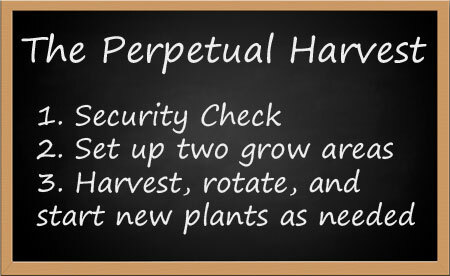 Now that you know how to run a perpetual harvest, get the tools you need to keep everything running smoothly! The right equipment will make the job much easier, which is worth quite a bit when paired with higher-demand technique such as the perpetual harvest. Grow Lights: Make sure you have two sets! Seeds: Good seeds pay for themselves! Nutrients: You’ll be going through nutrients twice as fast with this method.